Its here once more from Metrobank Online! Metrobank Credit Card promo for all gives special 2016 treats for every single receipt purchase direct using your Metrobank card. Until 2017, Metrobank Credit Card promo is still the best way to wisely spend for your fashion, tech, travel and food purchases since evrey minimum spend of 2,500 and 5,000 worth, there’s an equivalent tasty treat. Here’s the latest Metrobank online creditcards promotions for every purchase. Just use your Metrobank credit card ANYWHERE for a minimum single-charge of P3,000 and get FREE munchies at Robinsons Supermarket! Promo Period for this Metrobank promotion starts from July 7 up to September 30, 2014. Redemption Period begins July 7 until November 30, 2014. 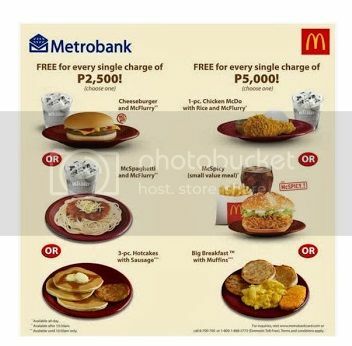 Start your purchases now to avail of these FREE treats only from Metrobank. It’s really the best thing for your budget. Another reason to spend more thru your Metrobank Credit Card. Its partnership with McDonald’s gives you more tasty promo treats! This Metrobank promo starts Oct. 15, 2013 to January 15, 2014. Redemption of McDonald’s treats is from October 15 – March 15, 2014. 3 Responses for "Metrobank Credit Cards Promo 2016 – 2017 Online Direct"
Hi good day po.do u have latest available teats for dis july. Where to apply a credit card the must convenient for me..less paper works.